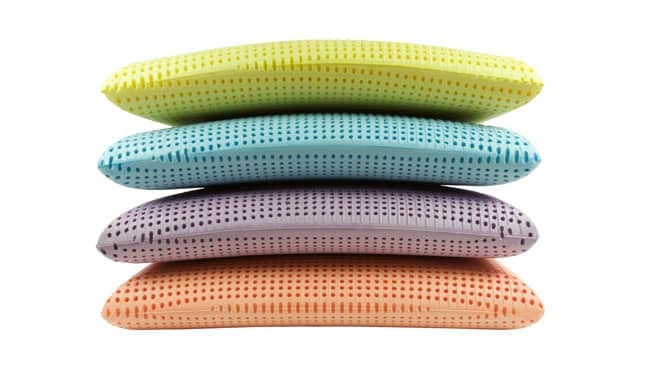 Blu Sleep Products, has developed a new range of Essential Collection foam pillows, that combines the power of aromatherapy with the innovative technology of Blu Sleep foams. Every Essential Collection pillow features natural oils, which provides a unique benefit and aids in taking your best night of sleep even further. Every Essential Collection pillow is made in Italy and comes Oeko-Tex certified. The natural soothing oils embedded in the cooling supportive foam pillows helps to create a sense of rest and well being. The Pillows are sealed within the factory, which discourages any foreign germs or bacteria to get inside the bag. The airtight seal means that there is no odor transfer from packaging, such as cardboard or plastic, which allows for a pure experience when the pillow is used for the first time. The pillow is compressed and can be restored by peeling the freshness label on the back of the sleeve.